We only have what is in the following list. No other invoices are available, so please don't ask. If we knew of anyone that had them, we'd tell you. If your car is not on the list below, but it is a 67-12 model, consider one of our Marti Reports. If you happen to be a 55-57 Thunderbird owner, please contact the Classic Thunderbird Club International at CTCI as they may be able to help you with those year invoices. After all, they are the reason Lois started all of this. We all fondly remember her as the "Pink Lady" and she had a beautiful Dusk Rose 57 Thunderbird. 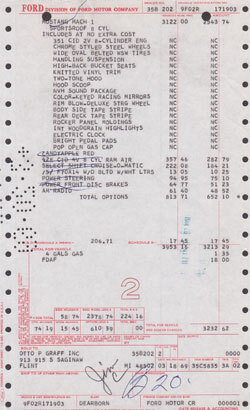 In rare cases, the original invoice may have been sold previously. A copy would be available. We will contact you to see if you want a copy should this apply to you. In certain cases, some invoices may be priced higher and/or more documentation is available for your particular car. In this case, you will be contacted about additional charges. Invoices will be shipped UPS GROUND with tracking. International shipments will be shipped Registered with Return Receipt. Please note with the increasing value of these cars that many of these vehicles are now no longer just fun, vintage cars. Some of these vehicles are becoming part of Automotive History. As such, the paperwork becomes an important part of that history. If you purchase any paperwork, please use adequate care to preserve it for posterity. 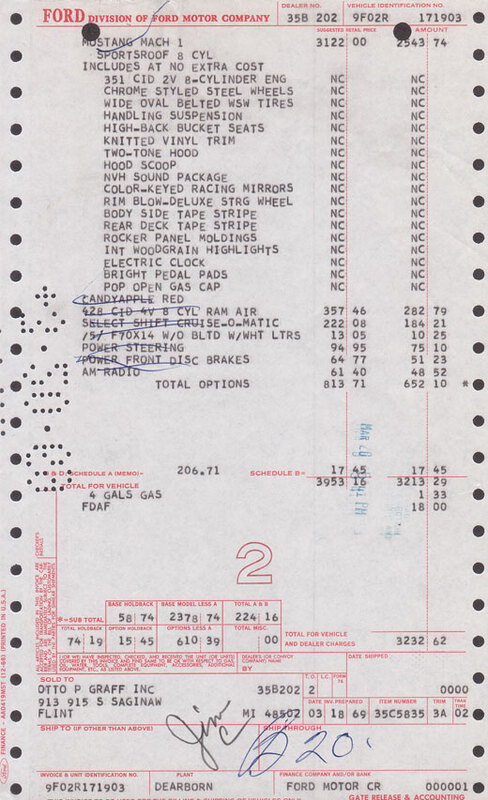 Some day, Ken Burns IV may be doing a special on your car and it would be nice to provide him with the original sales invoice for the sake of filming (or holographing)!